Creative pillows and unique pillow designs from all over the world. As you rest your head on the pillow for those valuable last few moments before you wake the words Good Morning Sweetheart are gently pressed onto your cheek. Even though you may feel tired and drowsy your loved one can see how you feel. Stylish pillows that look like giant pieces of sushi. Choose the delightful Shrimp Nigiri… or go for the delicious Salmon. There’s even a giant green Edamame for you to cuddle up with. 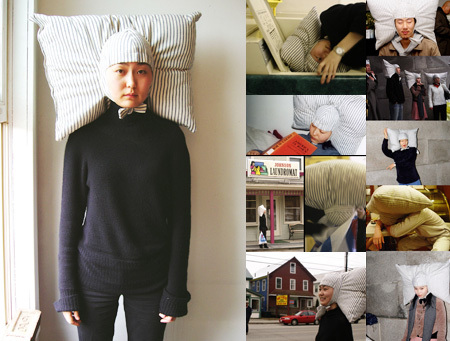 Wearable pillow that allows users to sleep comfortably whenever and wherever they like. 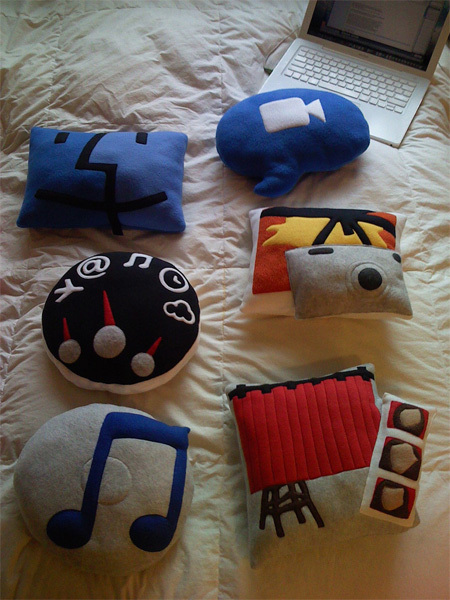 Collection of pillows inspired by Mac OS X icons from Throwboy. 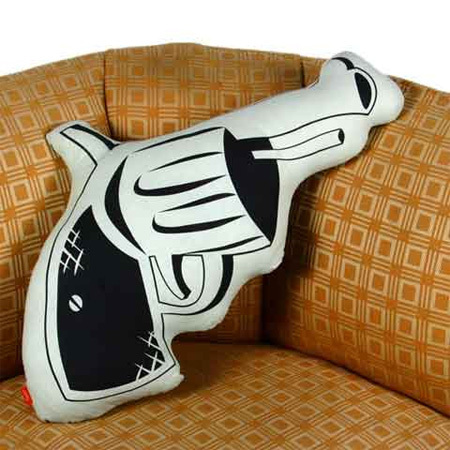 Rest your weary head on this comforting gun pillow made by the good people at Gama-Go. Sleep comfortably on your laptop with this pillow. When you close your laptop, iSleep pillow gets filled with warm air, music is being played and after 10 minutes the alarm clock rings. Cecilia Lundgren, a talented designer from Halmstad, has designed these creative pillow cases for lonely singles. A great conversation piece for the wannabe wise guy who has everything, and whose wife won’t let them own a revolver. 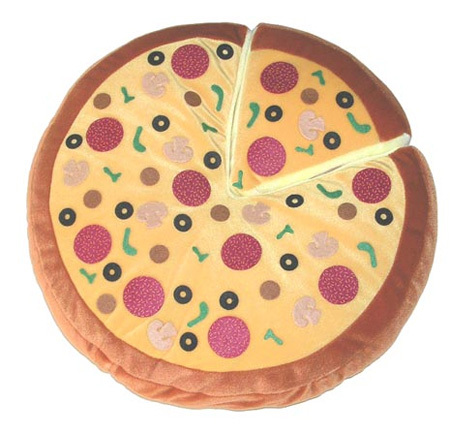 Pepperoni Pizza plush pillow with cheese, lettuce, and beef. One of the slices is also removable with velcro attached. 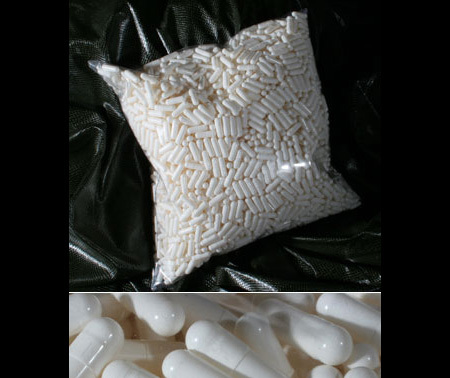 Creative pillow design from CarteBlanche, a luxury products company pioneering “cocaine-chic” couture. Creative pillow designed by Ranch Box looks like a regular book. If you love your iPod and can’t bear to be parted from it even when asleep then this is the solution, the MP3 Pillow, a pillow shaped like an iPod. 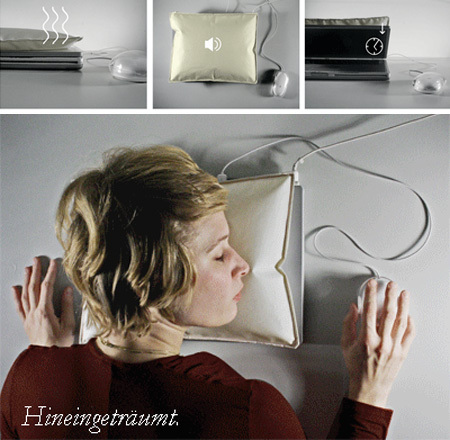 The pillow also incorporates a speaker so you can listen to tunes while you snooze. 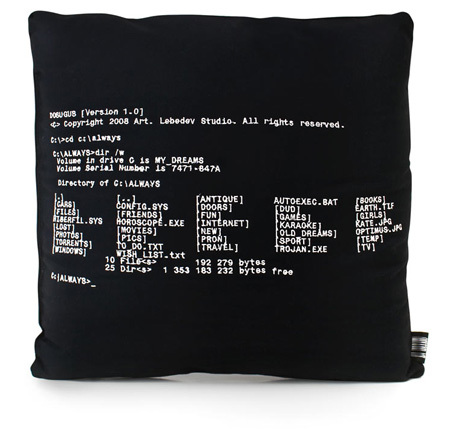 Dosugus pillow looks like a black screen with good old DOS directories embroidered on it. 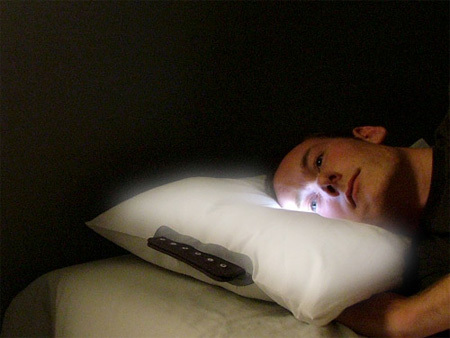 glo Pillow Alarm Clock uses LED fabric substrate to wakes the user using light. This substrate also functions as a display, showing the time on the surface of the pillow. The pillows are inspired by those suspenseful moments when a sleeping loved one is a little too still for a little too long. Using an irreverent combination of comfort & fear the pillows parallel sleep & death. 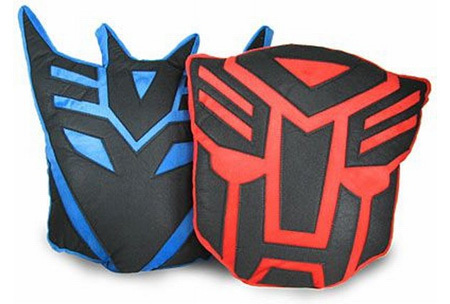 Pillows featuring the Autobot and Decepticon Transformers logos. This unusual pillow is a must-have for the bacon lover in your life. Creative iDream pillows designed by Studio Psycho from Ukraine. hahah these are great! I wonder what they will think of next…. The iDream and the morning message pillow are awesome!!!!!! I totally love the horse head. It is def. my favourite. love the blood puddle pillow ! 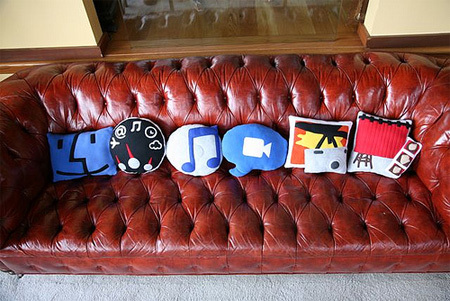 pillows inspired by os x icons, are great! Wow…love..love ..love the blood puddles!!!! Hah, the horse pillow is a must. The horse head pillow and the stone pillows are my favorites. Does anyone know where one can have their own design made in too a pillow or sheet? the blood puddle and stone pillows are the best. and i’d totally wear the pillowig. the pillowig is funny. reminds me of when i was little and i had this “baby pillow” with the pillowcase seam at the center. i’d wear it as a wig and run around. my cousin (a few months older than me) would often follow suit with a full-size pillow. that is very very cute.. I like the ‘stone’ pillows! But different colors that match real rocks. That would make a great ‘romp room’ for the hyper six-year-old set. Make ’em just small enough to be washable in front loading washers, (washers without the center agitator.) Oh, one more thing, make sure nothing else in the room is breakable!!! (fish tanks, lamps, pictures on the wall etc.) A fun room for all. Ahah, the Wearable pillow has to be mine! Wow those pictures made me feel quite sleepy lol! 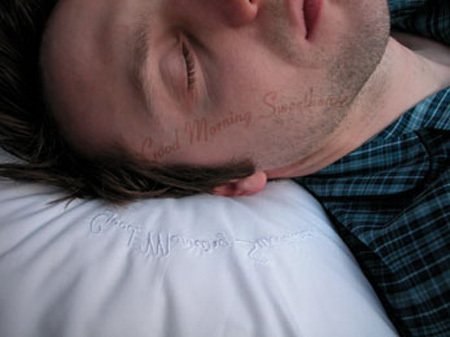 The Good Morning Sweetie pillow was funny, although it would really annoy me waking up with it on my face before school or work. The Laptop pillow is cute since the laptop warms it up for you, although I doubt I would ever use it. I would think the weight of your head could be bad for the laptop anyhow. And the group of Stone pillows are awesome except that if I had them in my future apartment, they probably wouldn’t look like stones. Instead they would look like ugly, gray, misshapen pillows that make the room dull. 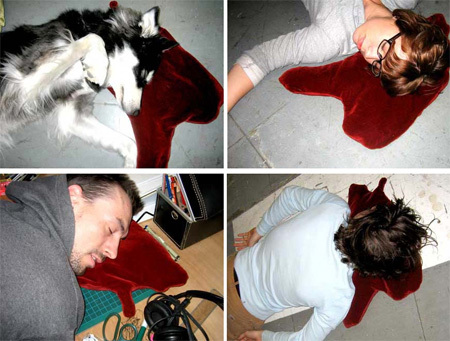 The Blood Puddle pillow is really disturbing, and so is that Horse Head. WHY WOULD ANYONE WANT THAT? 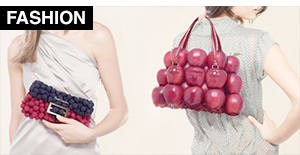 All the Apple inspired pillows are almost sickening. The other designs were great, though! Very fun post! One correction: That is not lettuce on the pizza. It is most probably green peppers. Lettuce on pizza? Yuck! I loved all the pillows exept the laptop pilow. Sleeping on your laptop couuld overr heat it and also call damage. The bloodyy pilow could turn out to be a good prank. :) Nice Work. I love the horse Head and Blood Puddle pillows. 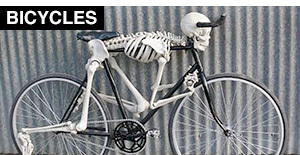 But I am one twisted fellow, regardless…great pics. Would love to get the horsehead pillow for my Godfather/Goodguy-fan son!! I love the Sushi pillow, Blood pillow and the PillowWig! They’re all so awesome! Kawaii ne? so dane..kawaii desu..subarashii.. :) this is really cool….i like them all..
the Wearable pillow is just silly, who in their right mind would wear them on the street??? cute pillow. i like that. Is that Kurt Warner on one of the blood puddle pillows? Great ideas. I like the stone and blood puddle pillows. The horse’s severed head from The Godfather. OMG I laughed til i pissed myself. Really very clever! great overall pillows, those are indeed the best I’ve seen in a long time. lol I LOVE that blood pillow my mom would wake me up and she would call 911 for no reason and id wake up laughing my head off! 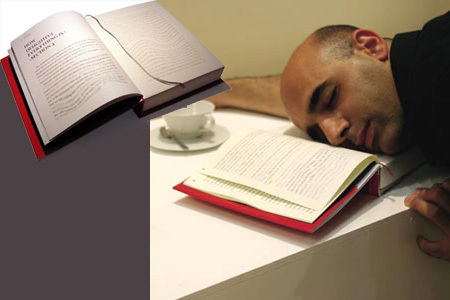 … The book pillow is a real book. 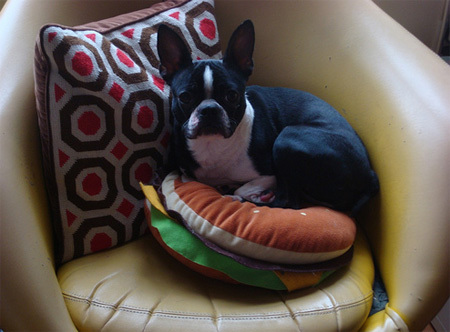 I love the bacon pillow. Yummy. i like the book pillow. the blood one kinda creeps me out..
blood paddle pilloes are my fav. Really Nice Pillow! Great concept, good piece of creativity and amazing ideas! The iDream one is stupid. Why would you really want that? It’s one of those things you’d buy and then not want after like 3 days. Wow, excellent post. I love the horse head and the stones. AWESOME!!! love the computer ones!! these pillows are such great ideas! i lovee the singles pillow.. that is freakinn hilarious imma have to let all my friends know bout this website i lovee going on this website when i am boredd. 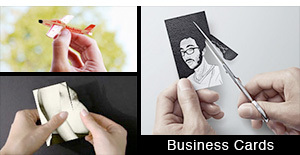 very good ideas.i like very much. That would be a hard pill to swallow! jhakas post, very nice collection of pillows.. I like the gun pillow very much. the wig pillow is crazy! i love the sushi pillows. 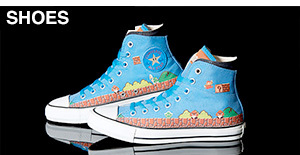 OMG these are awesome! :) the sushi ones are cute! Funniest and cutest pillows I have ever seen. I want one. They should make pillows that look like the icons on an iphone. These are the coolest i want them all especialy the blud pellow !!!!!!!!!!!!!!!!!!!!!!!!!! sooo cool. Love the book pillow! Perfect to take into work! I really want the iSleep laptop pillow. It would be very useful during final examine times. 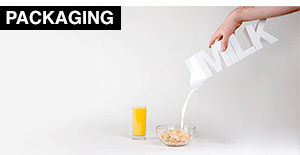 I really like that it has an alarm clock for 10 minutes later. I want the ipod pillow!!! that is sweet!! the blood and horse pillows where just annoying and not funny– i love idea of the message one its so sweet! fact that the laptop pillow heats up with the warm air is really sweet although it probably wouldnt be such a good idea to sleep on your laptop love the rocks and the apple icons are super cute!!! Anyone….where can i get those pillow ? 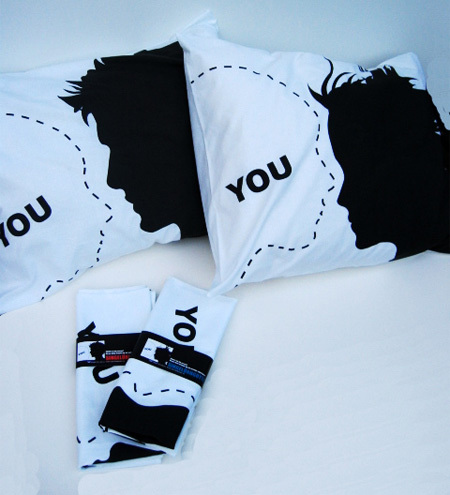 Those pillows are awesome!..and I want one ASAP! The message pillow is such a great idea, defiantly usuable for april fools jokes! It is fantastic, I love all of them . nice but rlly who would sleep with a horse head pillow? or a puddle of blood pillow? why not just a regular pillow? 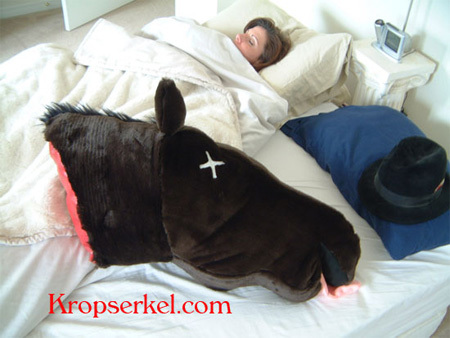 Love the horsehead pillow! buuut is it just me or does the bacon pillow not look anything like bacon..? The horse head pillow is legit! some of these pillows are just to cool. it’s amazing what we get when someone has to much time on their hands. i like the horse one, the book one is totally cool and the best one is the stones!!!!!!!!!!!!!!!!!!! is the book one an actual pillow? it looked real..
Busted out laughing at the horse pillow. That was great! Bahahahahha!!! I love all of them! 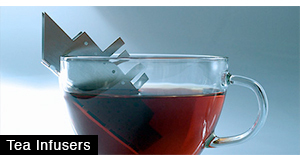 they are all really cool, esspecially the blood puddle. I find it EXTREMELY funny. But my all time favourite of the buch would definatley be the mp3 player pillow! hehehe love it!!! Its very modern and stylish. I would buy it any day!!! I love the stone pillows and the idream pillow and the glowing ones. 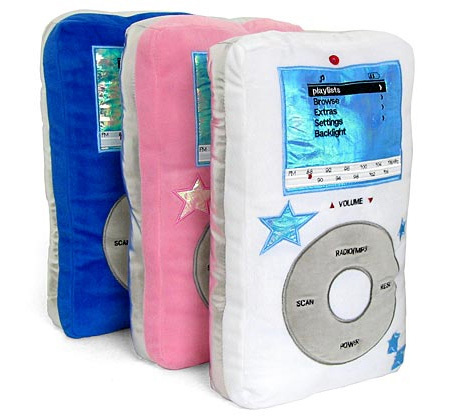 I have the mp3 pillow in Pink…its cool cuz u can listen to the radio or u could plug in your ipod and listen to your own songs. 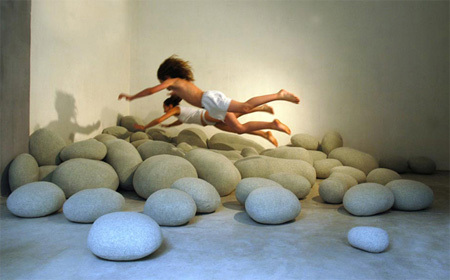 The stone pillow is a great idea. The wearable one ( pillowig) is sooo funny…lmao..hehe..perfect for some ppl i knw. 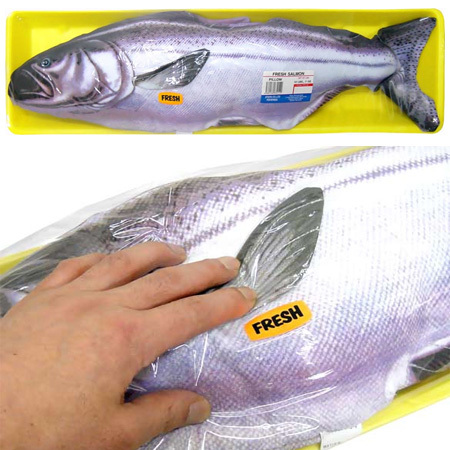 How can i buy the sushi pillow please? i love the idream pillows its my favorite and its so sweet and looks comfortble. I LOVE the alarm clock pillow. Thanks for compiling these. Make it look like you hit your head on a rock while using the blood pillow. How cool is that?